Notes: A member city of the Ionian Dodekapolis, Teos was a thriving seaport with two fine harbors. It was the birthplace of Anacreon the poet, Hecateus the historian, Protagoras the sophist, Scythinus the poet, Andron the geographer, and Apellicon, the preserver of the works of Aristotle. When the Persians under Cyrus invaded circa 540 BC, many Teans fled, resettling in Abdera. 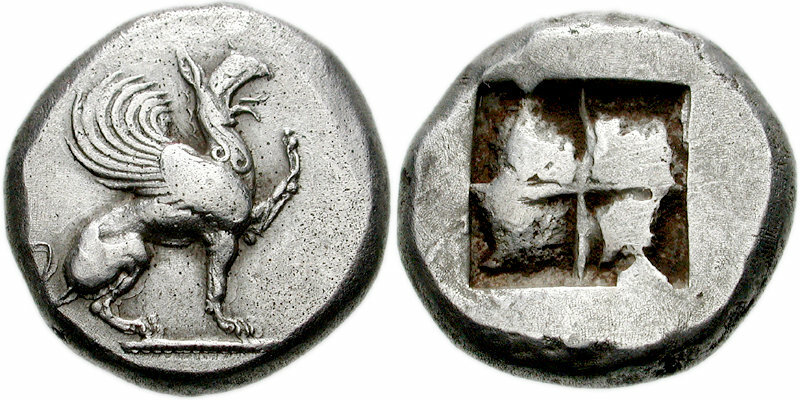 The griffin was the badge of the city of Teos, and is present on the coins of both cities.